While it seems a little strange to control a game like After Burner Climax with tilt and virtual buttons and flight sticks, it works surprisingly well. A fun arcade-experience for the iOS! Any old-school Sega fan remembers After Burner the 1987 arcade flight simulator, developed by Yu Suzuki, one of Sega’s most popular game designers. If you had the chance to play the original After Burner before it came to home consoles, you were given the authentic F-14 cockpit experience. At the time, it was the closest that Top Gun fans could come to pretending to be Maverick or Ice Man without signing up for the Air Force. After Burner was played sitting down, as if you were really piloting the plane. You controlled the game with authentic-looking controls including a throttle and flight stick. After Burner Climax is the latest release in the After Burner franchice, and this iOS version is a mobile-friendly repackaging of the game that was originally released as a downloadable title on PlayStation Network and Xbox Live Marketplace. The throttle and flight stick have been replaced with touch-screen controls, including virtual buttons and sliders, as well as accelerometer implemention for that tilt-to-move experience. Admittedly, the experience of sitting down to play After Burner and using the authentic arcade style controls has been something that has been lost for a long time since the transition to home video game consoles — unless you were willing to pay extra for the recommended accessories. 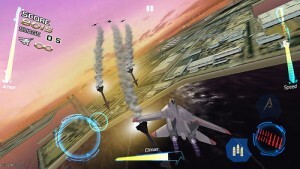 While After Burner Climax for the iOS doesn’t feel quite as tight and accurate with the touch controls as I’m speculating the controller-based Xbox 360 or PlayStation 3 bretheren would be, it still works and plays pretty well. 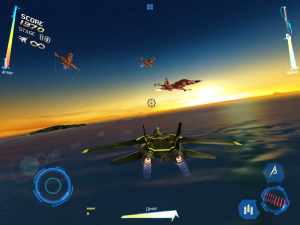 Much like its predecessors, After Burner Climax, focuses on very specfic aircraft: The F-14D Super Tomcat, the F-15E Strike Eagle, and the F/A-18E Super Hornet. Each jet can be personalized with different paint jobs, without requiring unlocks to access them. 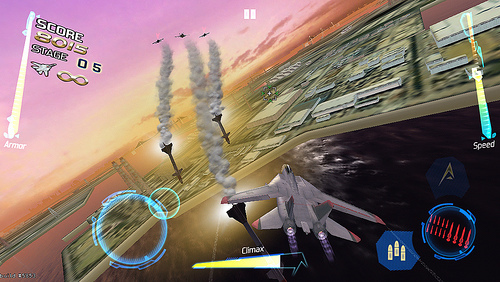 After Burner Climax offers three different modes: Arcade Mode, Score Attack Mode, and Climax Mode. The Arcade mode and Score attack mode are pretty self explanatory. The terribly-named Climax mode is thankfully more enjoyable than its terrible, and sexually-charged, name. Old school fans, may appreciate the ability to select music from the classic After Burner II, which can be set from the main menu. You can control the game in a variety of different ways. The virtual flight stick can be used by swiping your thumb around the lower-left side of the screen. You can use your iDevice’s accelerometer to control the aircraft by tilting the device. If you’re looking for something closer to an authentic experience, you can use combination of the two, where you control the jet using a virtual flight stick and tilt the device to control the throttle. This latter control scheme allows you to focus solely on blasting the enemy out of the sky by tapping the virtual buttons and while not needing to take your finger off the trigger to slow down or speed up. It looks great and plays great on a 3rd-generation iPad. The speed is fast and furious, and the resolution is nice and crisp thanks to the high-resolution retina display. According to the description, it’s also been updated for the new iPad Mini. You’ll fly through a variety of picturesque environments, from jungles, frozen ice caps, and volcanoes, and litter them with fiery enemy debris and missile smoke trails! Yee haw! The textures on the aircraft are pretty nice. There are moments, like during a crash, where the action stops and you can see some of the game’s blemishes and low-resolution textures, but it’s nothing worth more than a quick mention. There are some load times, that sort of verge on feeling a bit too long, even on the iPad, but it’s not terrible. That being said, you’ll probably only want to play this on the latest model of whatever iOS device you’re using. After Burner Climax looks to require some fairly modern hardware. 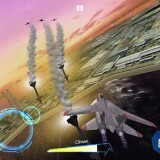 After Burner Climax is available for $2.99 in the iTunes App Store. It is a universal app which means that it can be played on all sorts of iOS devices, but for the best experience you’ll want something fairly new. According to the app page, After Burner Climax isn’t playable on many older devices. 3rd generation to current models seem to be the prerequisites.